WASHINGTON — The U.S. 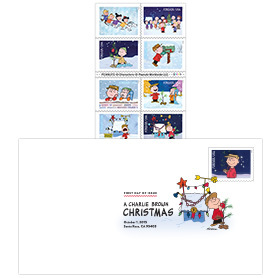 Postal Service begins celebrating the holiday season by dedicating the Charlie Brown Christmas Forever stamps Oct. 1. 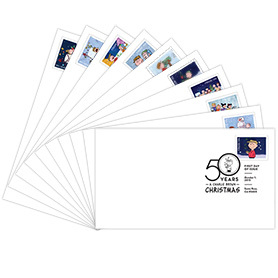 The booklet of 20 stamps features 10 still frames from the 1965 TV special “A Charlie Brown Christmas”(two of each design) celebrating the classic’s 50th anniversary. The official dedication ceremony will take place at the Charles M. Schulz Museum in Santa Rosa, CA, at 9 a.m. PT. The event is free and open to the public and the stamps will be available nationwide that day. 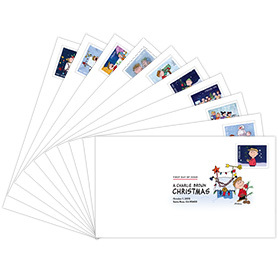 Customers may pre-order the stamps now through this link only for delivery shortly after Oct. 1. 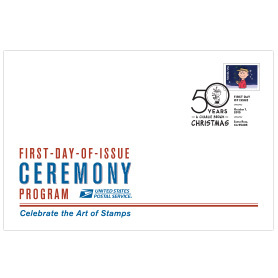 Scheduled to join Postmaster General Megan Brennan at the ceremony are: Schulz’s widow Jean Schulz; Schulz’s son Craig Schulz; and, A Charlie Brown Christmas Executive Producer Lee Mendelson. 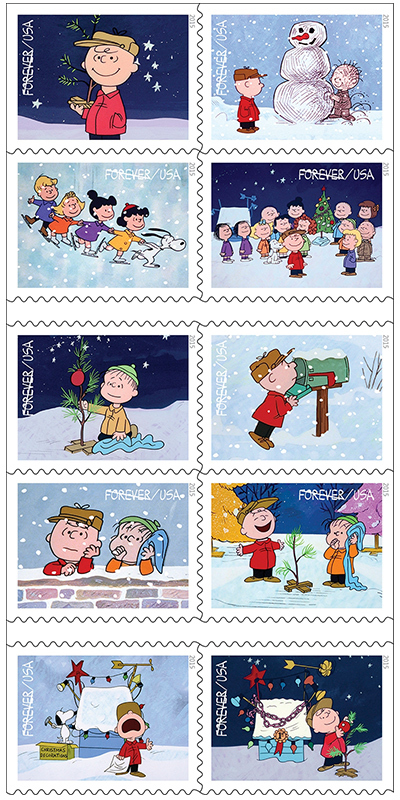 The stamp images include: Charlie Brown holding the sapling that eventually becomes his Christmas tree; Charlie Brown and Pigpen with a snowman; Snoopy and children ice skating; the cast of the program gathered around the Christmas tree; Linus kneeling by the sparsely decorated Christmas tree; Charlie Brown checking his mailbox for a Christmas card; Charlie Brown and Linus leaning on a snowy brick wall; Charlie Brown and Linus standing by the Christmas tree; a frustrated Charlie Brown standing in front of Snoopy’s doghouse; and, Charlie Brown decorating the tree in front of the prize-winning lights display on Snoopy’s doghouse. Art director Antonio Alcalá Alexandria VA, designed the stamps. The early October release of the stamp coincides with the Peanuts comic strip debut in seven newspapers on Oct. 2, 1950: The Washington Post, The Chicago Tribune, The Minneapolis Star-Tribune, The Allentown Call-Chronicle, The Bethlehem Globe-Times, The Denver Post, and The Seattle Times. When Schulz announced his retirement in December 1999, the Peanuts comic strip was syndicated in more than 2,600 newspapers worldwide, with book collections translated in more than 21 languages. “A Charlie Brown Christmas,” the first animated special featuring characters from Charles Schulz’s beloved comic strip Peanuts, aired on CBS the evening of Dec. 9, 1965. Over the years, the ode to the holiday season has become a tradition. The program now airs annually on ABC. Work began on “A Charlie Brown Christmas” in the spring of 1965, when Schulz met with producer Lee Mendelson and animator Bill Melendez. Instead of hiring adult actors, the group decided to take the then-unusual step of having children provide voices for most of the characters. Schulz insisted that the program should not have a laugh track, which he considered cynical and unnecessary. “Let the people at home enjoy the show at their own speed,” he said, “in their own way.” Composer Vince Guaraldi contributed a memorable jazz score. “Linus and Lucy,” a lively piano tune that plays in the film, is still synonymous with Peanuts. 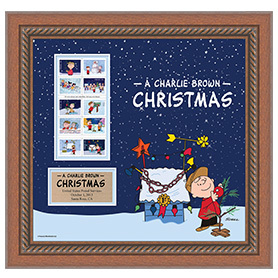 Watched in more than 15 million American homes, “A Charlie Brown Christmas” was a smash hit. It won the George Foster Peabody Award and an Emmy Award for Outstanding Children’s Program. 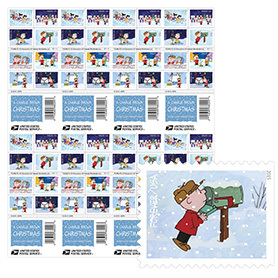 “A Charlie Brown Christmas” is being issued as Forever stamps that will always be equal in value to the current First-Class Mail one-ounce price.